It was a no brainer really, after watching this documentary it confirmed that if we cared about the environment then giving up meat (as well as other animal products) is the best thing you can do. The documentary does suggests a vegan diet, but for now we will stick with being vegetarian as there is a lifetime of habits to change but we will happily incorporate more and more vegan meals into our diet. I know what lots of people are thinking, “if you care about the environment so much why you are happy to fly around the world?“. As it turns fossil fuels are not the worst thing for the environment as they only account for 13% of all carbon emissions whereas livestock accounts for a whopping 51%, hence “cowspiracy”. See fact sheet below! Travelling as a vegetarian, although a little difficult was not too bad. We travelled another few weeks in Vietnam and then completed the remainder of our trip in Thailand and Kuala Lumpur. Vietnam was ok as we were near the end of our stay and were mostly based in Hanoi which has an amazing vegan cafe, Jalus vegan kitchen and our tour to Ha Long Bay was well catered for, we even got our first sample of fake meat… Sapa on the other hand caters for mostly Chinese tourists (as it is very close to the boarder), so lots of suckling pigs on a spits… really there is almost one on every corner… but there is the odd restaurant with a vegetarian set menu. My advice though is stay away from the Italian food there, it was not good! We were lucky that Thai food is very vegetarian friendly, with lots of curries and stir-fries to keep us going. 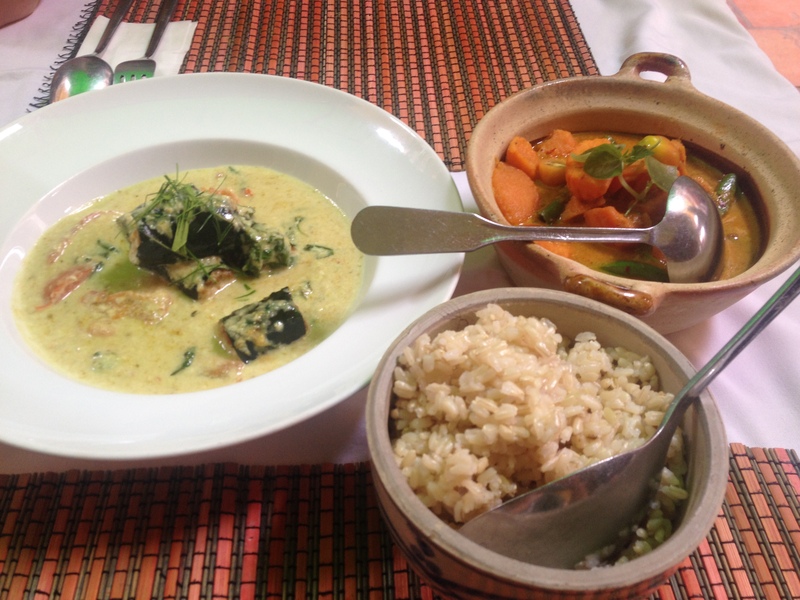 We even found lots of vegan and vegetarian restaurants with amazing food especially the small hippy village of Srithanu on Koh Pha Ngan and in Bophut on Koh Samui. Although, by the end of 3 weeks we were pretty over stir-fried vegetables and I am sure Ali’s taste buds have only just recovered from all the hot chillies. Kuala Lumpur on the other hand was extremely difficult. It didn’t help that we arrived the day after Ramadan finished because most restaurants were extremely busy so it was hard to even find somewhere to eat. However, it turns out Malaysian food is not very vegetarian friendly, so sadly we did not eat it once whilst there. This might be due to poor planning by us as every place we tried was either closed due to the holiday or only served meat. Due to Kuala Lumpur being a multicultural city we did enjoy Indian Food (Banana Leaf) and Middle Eastern Food! We have now been vegetarian for 3 months and so far it has been a really easy transition and we both feel amazing! I especially have more energy and feel like my body is working better than ever. Happycow.com – this website is your guide to eating Vegetarian or Vegan in cities all around the world.